Evans has spoken of trying, in his work, to hold together two (or more) terms that are in opposition to one another. In the examples above, it is virtually impossible to reconcile such different aesthetic registers; the wildly divergent conceptions of what a human body might look like effectively cancel each other out ­– or, rather, they frame each other in quotation marks. 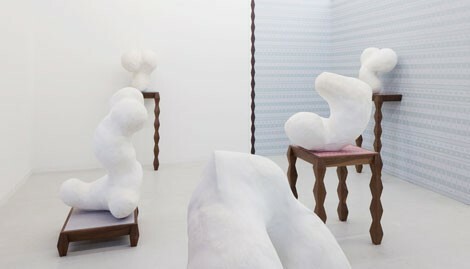 In the screen-printed patterns that Evans uses as grounds for objects to sit on (linguistic membranes between the plinth and the sculpture), repeating icons such as bones or tadpoles line up in dazzling but senseless rows. They look like language, but are in fact only fragments of alphabet, abandoned by syntax and grammar to sit mutely like a tray of letterpress type. Perhaps, instead and somewhat more encouragingly, the soul of Evans’ work is secreted in between these clashing registers of rootless forms. Marcel Duchamp described the infinitessimally narrow space between, for example, a glass and the table it sits on as infra-mince. Evans’ patterned surfaces occupy the infra-mince space between plinth and figure, but there are, of course, further gaps between them and whatever else they are touching. It seems to me that it is in these zones of transition and becoming that the crux of Evans’ project resides. In between meaning and association, identity and expression, remains a narrow, unclaimed space of freedom and potential.